Luksus dressursal som kombinerer tradisjonelt design og elegant utseende med innovative funksjoner, som sikrer hesten comfort og rytteren optimal balanse. CAIR luftsadelputesystem, justerbare flexiblocs, utskiftbare bomjern og justerbart y -gjordsystem. Ultra smal i taljen og med større sitteflate. 1. klasses europeisk lær. Inkludert er også valg av bomjern, noe som vanligvis koster kr 400,- kun for jernet, + arbeidet med å skifte. 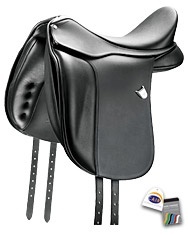 Bates Australia guarantees the Bates range of saddles for a period of two years against faulty materials, or workmanship. Further, the Elastiflex tree in your saddle is guaranteed against breakage for the lifetime of the saddle deemed to be 10 years. The warranty on a Bates saddle and its components are subject to use under normal conditions. The warranty card should be retained by the purchaser, along with the original receipt as the retailer will require it should warranty work be required. Saddles which require a repair under warranty should ideally be returned to the store from which they were purchased or your nearest stockist. Associated transport costs are the owner’s responsibility. 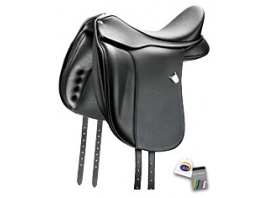 All fitting adjustments and saddle alterations should be made in accordance with the manufacturers recommendations.